With 7 years in Microsoft, I can safely say email overload and extreme multiplexing is a part of my life! 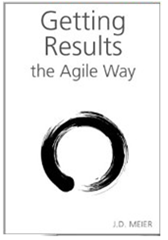 JD’s agile results has been a perfect system to find method in this madness. This helped me bring back focus to key “outcomes” on a daily, weekly, monthly reducing the complex and overwhelming web of pending work into a meaningful hierarchy of scoped and prioritized backlog. JD is super passionate about making others successful and he has used his superpower of enabling others to achieve results effectively in creating this comprehensive system of agile results. I have used this system for nearly the past half year and have benefited immensely from the simple yet powerful methods described by JD. It takes very little effort to create a clear concise plan for the day and the week that ensures I am in sync with my “hotspots”. The quick retrospectives help figure out productivity enhancers and time sinks and allow for quick course correction. And of course, I love being in zero email nirvana 🙂 … without being driven by Outlook. I am amazed at how effective and easy to follow this system is and absolutely recommend this to anyone that is trying to be more effective at what they do. Thanks for creating this beautiful system, JD!